Fight Code rolls on with its third event co-promoting with Oktagon in Italy. 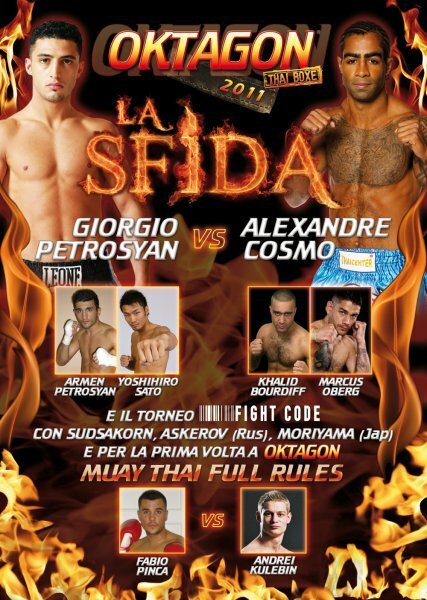 The main event match is definitely going to appeal to kickboxing and Muay Thai fans alike as Cosmo Alexandre is scheduled to fight K-1 MAX champion Giorgio Petrosyan. Though Cosmo Alexandre himself has spoke on his preference for real Muay Thai rules he captured the It’s Showtime championship under kickboxing rules. Alexandre first made waves on the international circuit of Muay Thai by fighting and beating Wanlop Sitpholek for the World Professional Muay Thai Federation (WPMF) championship in Thailand. Petrosyan despite starting out in full rules Muay Thai came to broader acclaim by participating in the struggling Japanese promotion K-1 MAX where he became its last tournament champion. Petrosyan also recently fought and beat some big international name Thai talents in Sudsakorn Klinmee and Kem Sitsongpeenong. Both matches were held under K-1 rules where arguably some of the Thai opponents’ best weapons could not be utilized. In the single Muay Thai match of the evening Belarus standout Andrei Kulebin will fight Thai Fight season one champion, Fabio Pinca. Kulebin has fought consistently against the most dangerous Thais competing internationally but fell short against Sudsakorn Klinmee at the WKN sanctioned Big 8 in Belarus tournament. Fabio Pinca of course has fought a long list of name Thaiboxers internationally including beating Petchmankong Petchfocus to win the Thai Fight tournament. Apparently, Fabio’s time in Thailand has treated him well and he appears to be growing from strength to strength. Armen Petrosyan, the brother of Giorgio Petrosyan seems to exhibit the same skills that made an international star of Giorgio. Armen has the same slickness and ring intelligence that has helped him prevail in so many fights. He will be matched against Yoshiro Sato. Yoshiro Sato despite being best known for his K-1 MAX career and Japanese championship has an extensive Muay Thai background. Sato fought and beat nearly all comers with All Japan Kickboxing Federation (now defunct) in Japan. Sato has stopped opponents with his long knees and yes, actually his punches. The high point for Sato may have been his KO of Buakaw Por Pramuk in K-1 MAX competition. Overall, this is a very strong looking card but I cannot help but wonder how much better it could have been had every fight on the card been under full Muay Thai Rules. I agree! And by virtue of the rules, its the fight I want to see most!